Since 2008, I have been researching women in social media for my next book, Digital Sisterhood, and tracking the unique ways Spelman College uses social media and technology to promote its mission, academic programs, research, students, professors, alumni, social justice efforts, and community activities. Last December, I interviewed Lauren Brown Jarvis, a Spelman College student, who served as Spelman’s first social media coordinator, on Digital Sisterhood Radio. In April, I participated as a panelist at Spelman’s Digital Moving Image Salon’s Digital Doyennes event. What I learned is Spelman’s Office of Communications team led by Tomika DePriest has made sure that it uses a wide array of social media tools including Twitter, Facebook, YouTube, Flickr, blogs, ezines, and webcasts. That’s why StudentAdvisor.com named Spelman as one of the Top 100 Social Media Colleges (ranked 21st) in 2011. What a social media and technology trailblazer! Guess what social media tool is a big hit at the college? Twitter. Spelman maintains 15 Twitter accounts. See below. 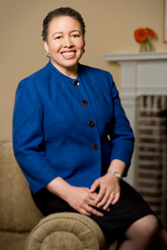 Spelman President Dr. Beverly Daniel Tatum is what I would call a top-notch Twitter Ambassador. When Dr. Tatum uses Twitter on her iPhone to communicate with students, parents, faculty, alumni, colleagues, donors, community organizations, corporate partners, and the general public, you get a snapshot of what it means to lead Spelman women in the 21st century. Her Twitterstream is decorated with a collection of moments from her daily life and travel adventures, shout outs to students and staff, news about campus activities and alumni, reflections and soundbytes from conferences and meetings, words of wisdom, inspiring quotes, event photos and videos, and donor requests. After reading them, you will fall in love with Spelman! In an effort to ensure Spelman students use social media effectively and wisely, its Division of Student Affairs provides a guide and related materials on social media decorum, requires each student to read and sign the Standards of Excellence Honor Code which includes a section on social networking, and offers student leadership training sessions to raise social media awareness. These efforts mirror Spelman’s social media policies. Spelman students harnessed their social media power in a video campaign to land First Lady Michelle Obama as their 2011 commencement speaker. Click here to watch the video. Their efforts were successful. On May 15, Mrs. Obama delivered a powerful address that is available now on Spelman’s YouTube Channel. I have to admit I watch it regularly for inspiration. My favorite part of the video is towards the end when Mrs. Obama quotes the words of author Tina McElroy Ansa, Spelman class of 1971: “Claim what is yours…You belong anywhere on this earth you want to.” I think these words describe the approach Spelman takes in expanding its presence in the digital world. Spelman students are expanding their presence in the digital world through the Robotics club a/k/a “The SpelBots,”an all female robotics team that encourages students to explore robotics and computer science. In November, Inside Spelman reported that The Spelbots received a $525,000 grant from the National Science Foundation to fund and expand STEM outreach. Did you know two SpelBots created a mobile application? In October 2010, AT&T announced Spelmanites Jonecia Keels and Jazmine Miller won the 2010 AT&T Big Mobile on Campus Challenge with their HBCU Buddy, an iPhone application created to educate and inform users about Historically Black Colleges and Universities in the United States. Keels and Miller received $5,000 each, a mobile device of their choice, a lifetime development license for Spelman, and all-expense paid trips to the AT&T Higher Ed Board of Advisors meeting and the EDUCAUSE Annual Conference. I could go on and on about Spelman, but I will end this blog post by saying seven things. Spelman women embody digital sisterhood, the feminine currency women use to create relationship wealth through the connections they make, conversations they have, communities they build, causes they support, collaborative partnerships they establish, and commerce they engage in with women they meet online and offline. Interviewing Dr. Bahati Kuumba about Spelman’s 11th Annual Toni Cade Scholar-Activism Conference on Digital Sisterhood Radio in March was an AWESOME experience! Meeting Dr. Ayoka Chenzira, Dr. Beverly Guy-Sheftall, Tomika DePriest, and Lauren Brown Jarvis at Spelman’s Digital Moving Image Salon’s Digital Doyennes event in April was one of my top 10 digital sisterhood moments for 2011. Watching Spelman’s Museum of Fine Arts YouTube videos is one of my favorite things to do. Spelman women rock social media. Listen to my Digital Sisterhood Radio interview with Jeshawna Wholley, class of 2011, in May. Having a “sistalove fest” chat with Dr. Ayoka Chenzira about Spelman’s Digital Moving Image Salon and her interactive art installation, Ordinary On Any Given Day, on Digital Sisterhood Radio during Digital Sisterhood Month in December. I am a Spelman fan for life! You can become one too when you LIKE them on Facebook, follow them on Twitter @SpelmanCollege, and support them financially by making a donation.